What are soft materials and why use them with robots? Soft materials in robots allow them to be adaptable by withstanding impact, temporarily store energy and deform to desired profiles. Additionally, the ability of soft materials to change dimensions (e.g. a 3D soft ball can be stretched into a 2D sheet or a 1D rod) make them a suitable candidate for being incorporated into robots moving in unstructured environments. I pursue research design and control of terrestrial soft robots with foreseen applications of exploration and search & rescue tasks in unstructured and semi-structured environments (e.g. natural disasters). Figure SR-1 : Family of soft material robots actuated by shape memory alloys (SMAs) and motor-tendons. 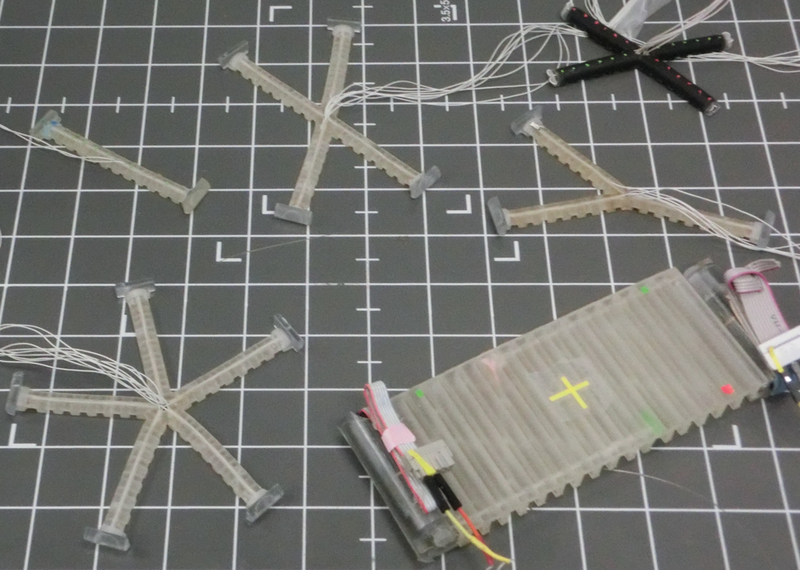 These robots use mechanisms to manipulate friction to effect locomotion. capable of locomotion in variable environments with ability to carry loads.